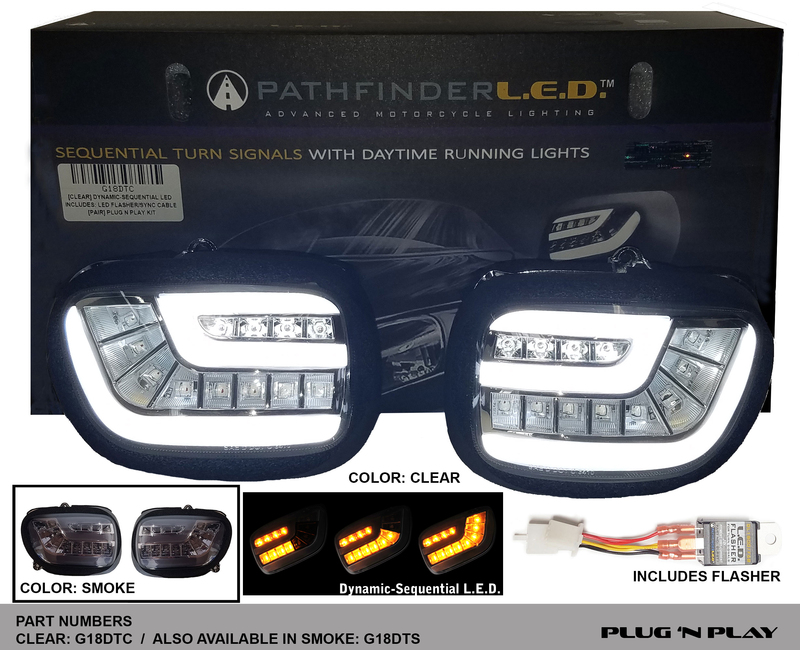 Honda GOLDWING GL1800 Dynamic Sequential led turn signal lens kit G18DT SoCalMotoGear.com - Professional Grade Motorcycle Lighting - Plug N Play Products - "Riding at night has never been brighter!" Note: GL1800/F6B Installation Videos below! HIGH PERFORMANCE DAYTIME RUNNING LIGHTS (DRL) W/INTEGRATED SEQUENTIAL TURN SIGNALS. GET READY TO ENHANCE AND UPGRADE THE LOOK AND SAFETY OF YOUR WING TO THE NEXT LEVEL! Designed from the ground up. ADD THE ULTIMATE VISIBILITY to your GOLD WING! Replace your factory indicator lens and upgrade to the latest in LED technology and add the Ultimate Lighting Upgrade to your Wing. THE G18DT Front Indicators have built-in Daytime Running Lights (DRL) that enable you to be seen - INSTANT VISIBILITY. This resembles the same technology you see on Modern Vehicles today. When your turn signals are activated, the "Dynamic-Sequential" Amber LEDs visually alerts opposing traffic to the direction you are turning and when they complete their operation, your lights return to Daytime Running Lights. Note: To enhance rider visibility and safety, when AMBER LED lights are activated the WHITE DRL's are deactivated. THIS PRODUCT IS RECOMMENDED TO BE INSTALLED PROFESSIONALLY. This setup is plug n play for 2006-2017 GL1800 motorcycles. IMPORTANT: Plug N Play for 2006-2017 (US) GL1800 models. NON US SPEC models may not be Plug N Play. Consult your local motorcycle technician for installation options. They will fit just not plug n play. Note: DRL on the lights stay on when the key is in the "ACC" position. WARRANTY POLICY: 1 year from date of purchase. We will replace a unit under warranty due to LED failure. Warranty does not cover condensation as this could be a result of riding in different weather conditions. International customers, please contact your local dealer. International shipping both ways is the responsibility of the customer. Warranty: 1 year from date of purchase. We will replace a unit under warranty due to LED failure. Warranty does not cover condensation as this could be a result of riding in different weather conditions. International customers, please contact your local dealer. We do not pay for shipping to replace an item. Shipping both ways is the responsibility of the customer. 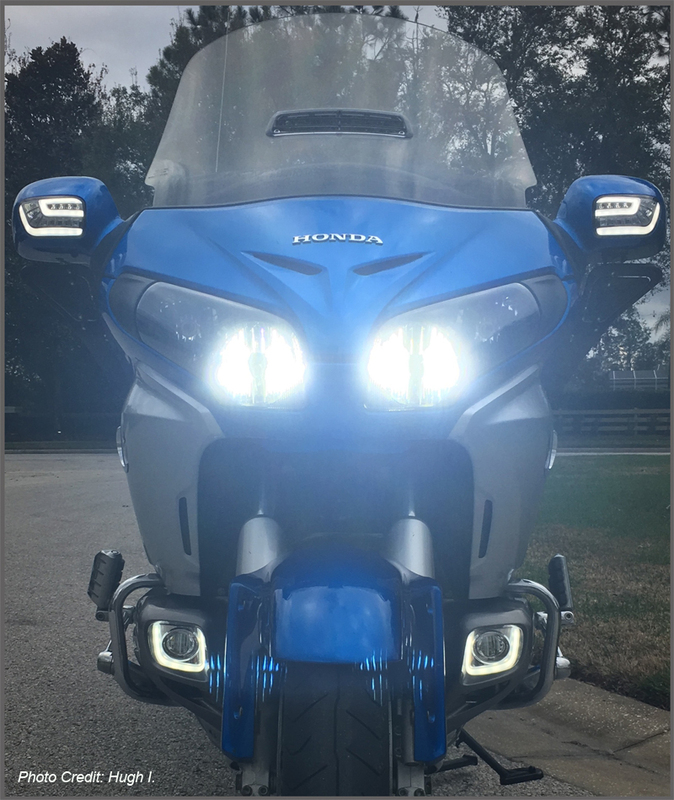 They are super bright, easy to install and they really add style to my 2012 Goldwing 1800. I would highly recommend these lights. The service at SOCALMOTOGEAR was outstanding. As usual SocalMotorGear produced a very fine piece of safety gear for it's rider clients. These mirror pods are awesome..... These are super bright, and increase daytime as well as night time visibility! Jake was very informative and a pleasure to talk with. I would recomend this upgrade to anyone looking to increase visibility to other motorists. And they make the fro t end look trick !